Powersolve’s new PSICL series is a low-cost peak inrush current limiter designed for capacitive and inductive loads in a variety of applications. 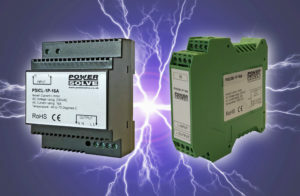 These include installations across complex automation systems and machinery as well as isolation transformers or LED lighting applications where they are particularly useful because you can have a large number of LED driver power supplies operating in parallel and all taking high peak currents together on switch on. The PSICL series is a true current limiter and cuts off all peak currents when starting loads under practically every AC condition. Extreme conditions can occur on AC lines in the event of a break in the supply and when power returns, high current peaks can often cause havoc and will trip circuit breakers. In decentralised areas, this will often lead to increased maintenance costs as the breakers require re-setting. The PSICL current limiter prevents this happening and can result in reduced cable cross section used and smaller and faster circuit breakers. The PSICL Series is available in three 230VAC single phase models with continuous operating current rating of 12A, 16A and 25A. Current limiting time is 100-500mS with repeat intervals of 1000mS. They have an operating temperature range of –40ºC to +70ºC and conform to EN60950-1 and EN61000-6-2,3 standards and are CE and RoHS. MTBF figures are 300,000 hours. 100H x 22.5W x 112Dmm. 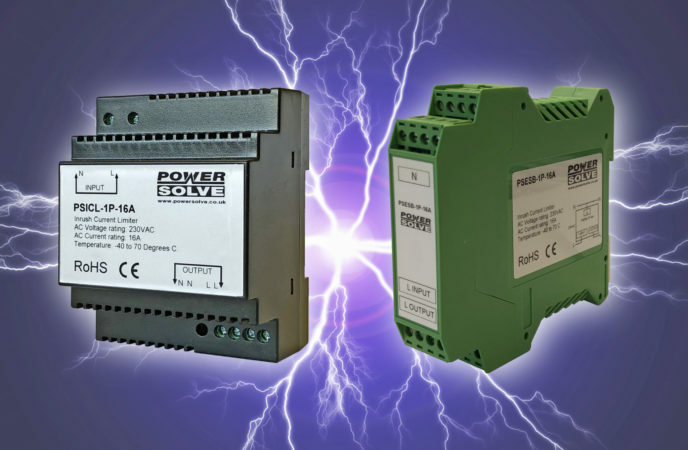 Both items are DIN Rail mounted and internal circuitry is identical for both versions.